Tilt-Up construction combines the strength and durability of reinforced concrete with the precision and efficiency of the Design-Build methodology. This one-two punch delivers new buildings quickly and economically, which might explain why more than 650 million square feet of Tilt-Up buildings go up every year. How does Tilt-Up construction work? How does Tilt-Up compare to alternative methods in terms of cost and quality? What are the main benefits of Tilt-Up construction? When is Tilt-Up not the right fit? How is The Korte Company using Tilt-Up? Video of Tilt-Up Construction: How The Korte Company Makes it Happen. 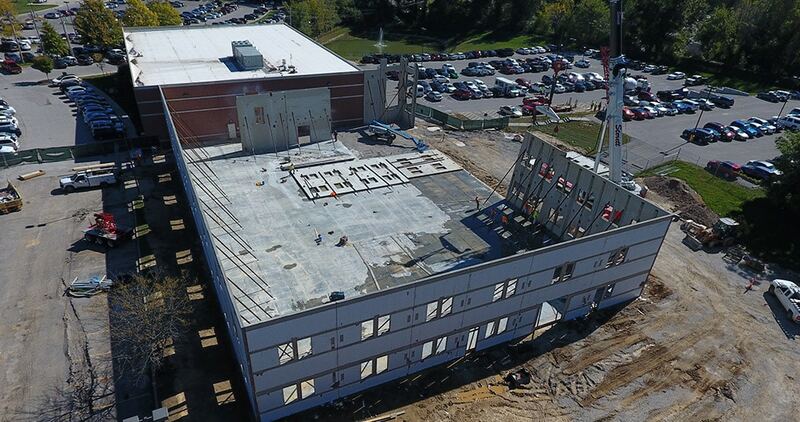 Tilt-Up construction features series of concrete panels tilted up into place to form a building’s exterior wall. These panels are created at the work site using wood forms, rebar and concrete. The forms are shaped and rebar cut to match final designs. Next, concrete is poured into the forms and finished. When the walls are ready, they’re tilted into vertical position and set on foundational footings where they form the external structure of the building. Each panel is temporarily braced until the roof ties the structure together. As we describe below, the outward-facing portion of these panels is a blank slate on which almost any exterior siding, cladding or veneer can be applied. Same goes for the interior, which can be further insulated or otherwise coated to meet the specific needs of a facility. People have probably been tilting walls into place for as long as they have been building them. Old-fashioned barns were raised using Tilt-Up, for instance. According to Concrete Construction magazine, commercial buildings using Tilt-Up construction first appeared in the early 1900s. The method became popular in the boom years after World War II, when a labor shortage placed a premium on economical construction methods. Since then, Tilt-Up has caught on across the U.S. and around the world. Advances in computer aided design and project estimation have dramatically increased the efficiency and flexibility of the Tilt-Up construction process. In a later section, we’ll discuss the ways owners can drive additional cost savings on a Tilt-Up project with the help of advanced estimating software. Tilt-Up: How does it compare? Wood-frame construction, which can be labor intensive. Steel beam construction, which is quite costly and therefore better suited to high-rise buildings. Prefabricated steel frame construction, which is also an economical solution but has some design limitations. There’s no one sector best suited for Tilt-Up construction. 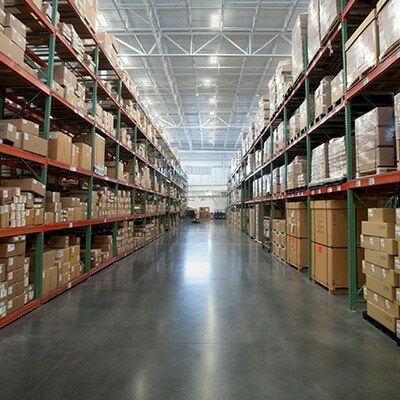 While it’s most commonly used for large-scale warehouses and distribution centers, you can use it anywhere it makes sense. 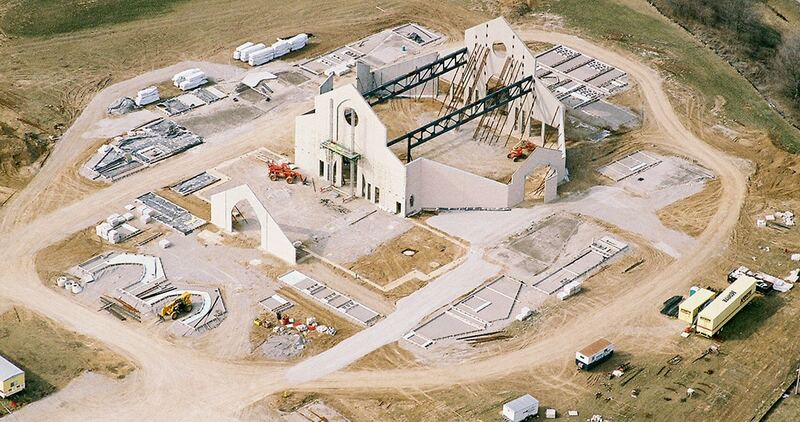 We’ve even built a church using Tilt-Up concrete panels. In general, Tilt-Up construction becomes more cost-effective compared to other methods as square footage increases. This is because greater efficiencies are realized as economies of scale kick in. 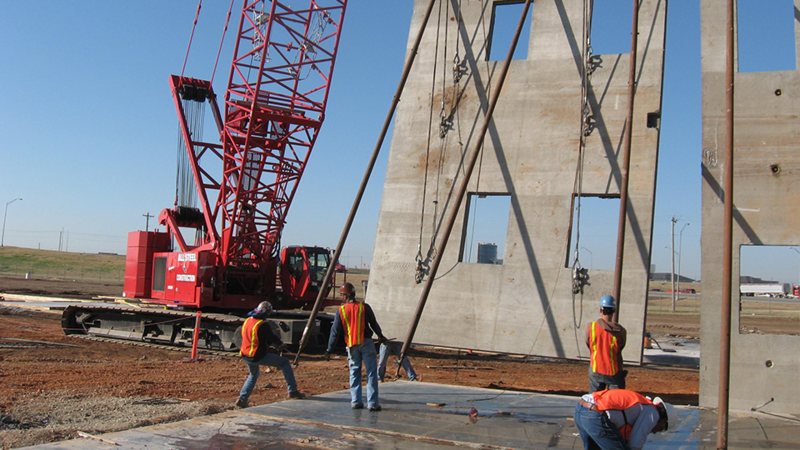 Because erecting Tilt-Up concrete panels can be done quickly, new structures become enclosed sooner. Once structures are enclosed, workers, their tools and supplies are out of the elements. A key rule on any job is to “be in the dry” as fast as you can, and Tilt-Up significantly quickens this process. Contractors retain more control over Tilt-Up projects since the panels are quickly assembled on-site with locally available materials and labor. Other methods calling for more specialized materials or highly-skilled labor are accompanied by longer lead times and higher costs. 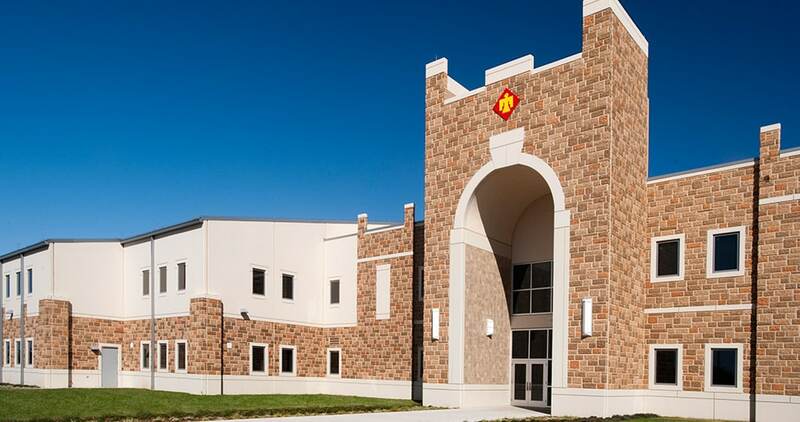 Tilt-Up construction was the answer when the Oklahoma Military Department needed a new Armed Services Reserve Center for its facility in Mustang near Oklahoma City. 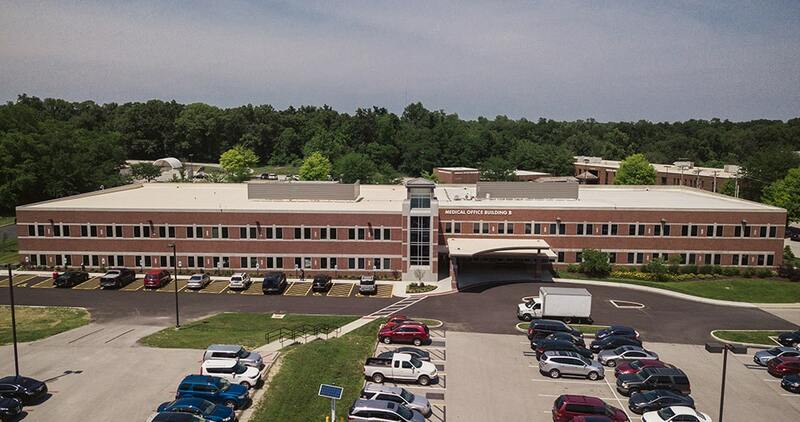 Our work consisted of erecting Tilt-Up panels for the nearly 164,000-square-foot center plus a 17,663-square-foot vehicle maintenance center. This job shows just how versatile the Tilt-Up method is. Far from being a simple structure, the Center features open office space that incorporates daylighting design principles to reduce lighting costs. It also supports temporary partition infrastructure to allow for different sizes of classes and training groups for service members. Other features include the high-tech weapons simulation space and a top-of-the-line fire suppression system. 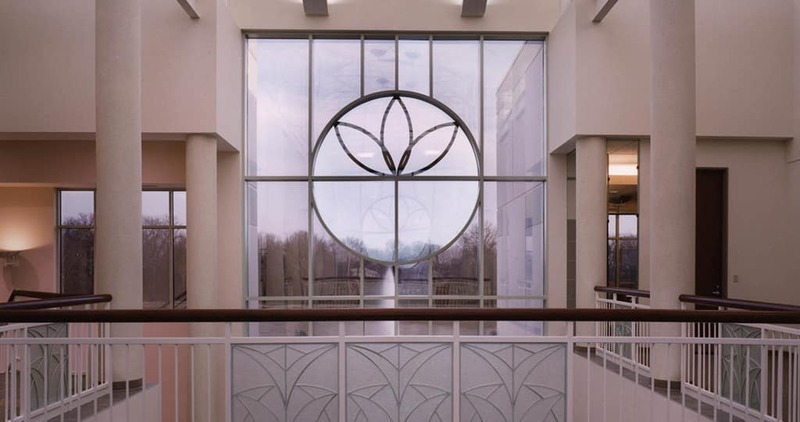 And, as with most military construction projects we complete, the Center was built to the Department of Defense’s strict Anti-Terrorism / Force Protection guidelines. We use this job as an example of what Tilt-Up is capable of. And rightly-so: Our work earned us high praise from the Tilt-Up Concrete Association. And it wasn’t the only Tilt-Up job that earned awards. We’ve also won Association awards for our work building a separate Armed Services Reserve Center in Norman, Oklahoma as well as for a massive addition to a Hitachi Computer Products factory, also located in Norman. Tilt-Up construction comes with many benefits that combine to reduce overall project costs, trim construction timelines and boost value to owners. Tilt-Up is extremely quick. The concrete panels only take a few days to cure, and tilting them into place is much faster and less labor-intensive than other methods. 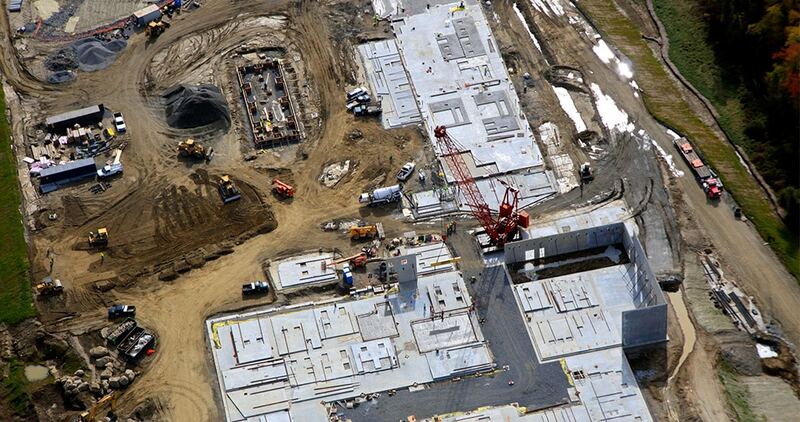 What’s more, later-stage construction processes like roof work and infrastructure integration can begin sooner on Tilt-Up projects because work sites become enclosed sooner. Tilt-Up requires far less skilled labor than other methods. Laborers pour and finish the concrete walls, and a crane operator lifts the walls into place. It only takes a handful of workers a matter of days to erect a building’s walls. And when it comes to construction materials, it’s much cheaper and easier to find ready-mix concrete and rebar from nearby suppliers. You don’t have to wait months for steel beams or complex components. Plus, some states offer economic development incentives like cancelling sales taxes on materials purchased in-state which can further trim costs. You can find lumber, rebar and ready-mix almost anywhere. Reinforced concrete is an excellent insulator on its own, and you can enhance thermal properties by creating walls with extra insulating layers for maximum energy savings. While customizing the concrete’s insulating properties results in higher costs up front, lifecycle cost analyses will show that Tilt-Up concrete panels help cut energy costs over time. But on a more basic level, energy is saved farther upstream when Tilt-Up construction is chosen. That’s because concrete production is far less energy-intensive than methods that rely on steel production. Design-Build companies use software to design to your exact specifications and remove costly unknowns from the construction process. Leading the way is 5-D Macro BIM, a software that combines computer-aided modeling and project estimation. As it pertains to Tilt-Up construction, owners can apply the software’s massive materials database to working designs to find the right exterior cladding or veneer. With this software, changes in cost and timeline are reported in real time as owners select alternatives, empowering them to make the decision reflecting the best balance of a structure’s function and form. We love Tilt-Up, but we should point out that it isn’t the perfect method for every construction project. For instance, Tilt-Up might give you “too much building.” If you’re building a farm implement shed or small storage warehouse, prefabricated steel might be better. Smaller structures don’t typically require the load-bearing capacity that larger ones do. Tilt-Up becomes the better option in terms of cost as size increases, but it’s not so great a choice when square footages head the other direction. The other material and construction types we mentioned above are probably better for smaller structures. Each project is different, so owners and contractors should work together to determine the point at which Tilt-Up becomes the more economic option. Finally, Tilt-Up concrete panels are naturally better insulators than other building types. But in settings where temperature control doesn’t matter, it may not be worth the expense of erecting a building with unneeded insulation built-in. Everything we build emerges from our dedicated Design-Build philosophy. We combine that philosophy with advanced technologies and decades of experience to shave critical days and hours off the construction processes. That’s how we’ve gotten so good at coming in on-time and under-budget. Around here, we’re fond of saying “the job is the boss.” Tilt-Up helps us turn those words into action. Want to see whether Tilt-Up is the answer for your next construction project? Let’s talk about it. You can also learn more about how this method could boost your bottom line by reading our guide to maximizing warehouse efficiency through smarter design. In this advanced guide to state-of-the-art distribution centers, we reveal design strategies to achieve streamlined operations, energy savings and rapid project delivery. Fill out the form to download this comprehensive but to-the-point guide.